Place the mixed baby greens in a large bowl. Peel the pears and cut into thin slices, removing the core and any seeds. Add the pear slices, cranberries and sliced red onion to the bowl with the greens. Toss with enough Favorite Vinaigrette to lightly coat everything in the bowl. 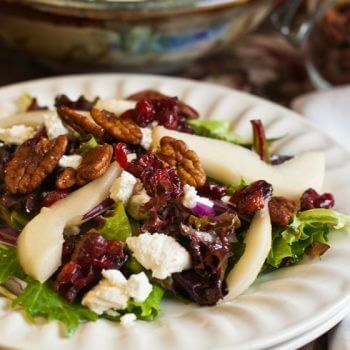 Sprinkle the Spiced Pecans and the goat cheese over the top of the tossed salad.